Call 20/7 Mobile Notary Services TodayFor Your Mobile Notary Public Needs! With over 20 years of experience serving Carmel, CA and surrounding cities, 20/7 Mobile Notary Services offers professional services for all of your notary public needs. Our expertise includes all types of legal documents. We come to you, making the verification of your documents simple and hassle-free. Locally owned and operated, 20/7 Mobile Notary Services provides professional mobile notary service throughout Carmel, CA and the surrounding areas. We know how stressful legal documentation can be. That’s why we deliver superior service right to your door, to make our step in the process simple and stress-free. We bring over two decades of experience to every transaction, including administration of oaths, affirmations, affidavits and statutory declarations, and witnessing and authenticating official documents. Our services include estate documents, healthcare documents, full and limited powers of attorney documents and real estate documents. Additionally, our National Notary Association (NNA) certified signing agent facilitates loan closings for the mortgage finance industry. Whatever your need for a notary in Carmel, CA, we have you covered. We are locally owned and operated, established in 2008. 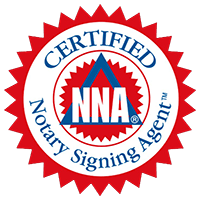 We are a proud member of the National Notary Association. We offer extensive experience with all types of legal documents. Our services include a full line of documents, from real estate to healthcare. We will meet you wherever is most convenient for you, such as your home, library or café. If you need a notary public, contact the experts at 20/7 Mobile Notary Services today for professional, convenient assistance.